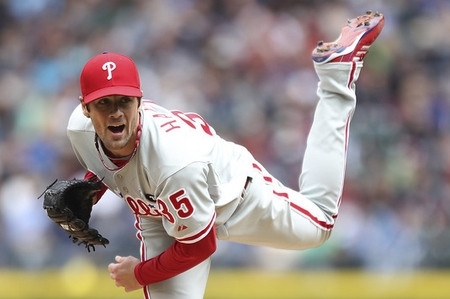 Hamels gave Philadelphia every chance to be the first ones to sign the ace pitcher. The native of San Diego has grown to call Philadelphia his home. He has played every year of his 7-year career here in Philadephia after being selected 17th by the Phillies in the 2002 draft. Hamels said, "... this is the place that I call home and want to call home for a really long time. I grew up watching Tony Gwynn play and he made San Diego his home for his entire career. That's ultimately what I want to make here in Philadelphia." This is the second largest deal made to a pitcher behind CC Sabathia's seven-year, $161 million contract with the Yankees in 2008. "We felt like it was the right thing to do under the circumstance with his performance, his age, his importance with our club," general manager Ruben Amaro Jr. said at a news conference at Citizens Bank Park. "Our goal is to continue to be a championship-caliber team, for now and the future. As I've said before, I think we have a much better chance with Cole as a major part of our rotation than without him."